On the left above is the ivory cover from the Pericopes of Henry II, an illuminated manuscript dating from c 1002. On the right is the lid of the sarcophagus of Mayan King K'inich Janaab Pakal I, who died in 683. The manuscript was produced at the Abbey of Reichenau, in southern Germany. The sarcophagus was discovered in 1952 at the Mayan city of Palenque, in Southern Mexico. K'inich Janaab Pakal I was the king of the Mayan city-state of Palenque, located now in Southern Mexico. His long reign lasted from 615 – 683. His tomb was discovered in 1952. The complex iconography of the lid of the sarcophagus has kept historians busy since it was discovered. Pakal lies, infant-like, at the base of a stylised cruciform tree. Beneath him is the head of a serpent, sometimes interpreted as a skull. Above the tree is a strange, supernatural bird. Around the top edge are cosmological symbols of the sun, the moon, and stars; the celestial realm. The position of the king signifies resurrection or rebirth, a return from the kingdom of the dead represented by the gaping jaws of the snake. 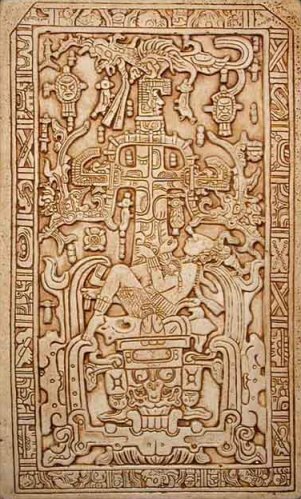 Pakal is shown as the maize god, the god of the agricultural cycle; he has been resurrected as a divinity, responsible for the cycle of death and renewal. The tree, bejewelled and with writhing snakes, is bursting into life. A pericope is nothing to do with submarines! It is a gospel text specifically selected for a particular service or feast day. 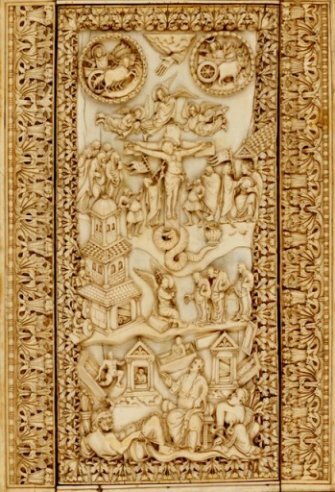 The cover of these pericopes is one of the finest examples of Carolingian ivory carving. The main element is the Crucifixion scene. Christ is seen slumped on a roughly-hewn cross with arms like cut tree branches. Whether He is represented here as alive or dead is a matter for debate. He is surrounded by figures familiar in crucifixion scenes: John, Stephaton, Longinus, the weeping women. The allegorical figure of Ecclesia collects the blood of Christ in a chalice. The two figures to the far right have led to much debate. Synagogia? Personification of Jerusalem? No one is quite sure, though the disc one of them holds is highly suggestive of a paten, another Eucharistic symbol. Above the Crucifixion scene are angels carrying the instruments of the Passion. Above them are the symbols of the moon and sun. Below the cross is a writhing serpent, personifying sin and death, and also the serpent in the Garden of Eden which caused the downfall of the first Adam. Christ, the second Adam, has vanquished it. Clearly, any hint of Mayan culture was unknown in Europe in the Middle Ages, and the two lifestyles and belief systems were totally different. The Mayans had many gods. And yet it is intriguing how many elements the two images have in common. Both of them relate the wider universe – the sun, the stars, the sea and the earth – to the narrative. Both images show the snake as personifying death and evil, and the tree as the embodiment of new life and fertility: the tree of life that ‘blossomed again in the resurrection so as to become the beauty of all’. (Bonaventure, The Tree of Life.) Above all, the central message of both images is the same – the resurrection of a human into a god to bring about rebirth and renewal. Even here there are significant differences. As far as we know, Pakal died a natural death, while Christ was sacrificed to bring that renewal about. Of course, sacrifice was important in Mayan culture, and a bloody business it was too. Let’s not forget, though, the importance of blood in Christian theology; look again at Ecclesia in the pericope cover. So what conclusions can be drawn? What the two images bring to the fore are those nagging archetypes that just won’t go away. However distant and unrelated cultures are, that collective unconscious keeps throwing up those symbols. Individual minds can then interpret them and use them in their own distinct way.